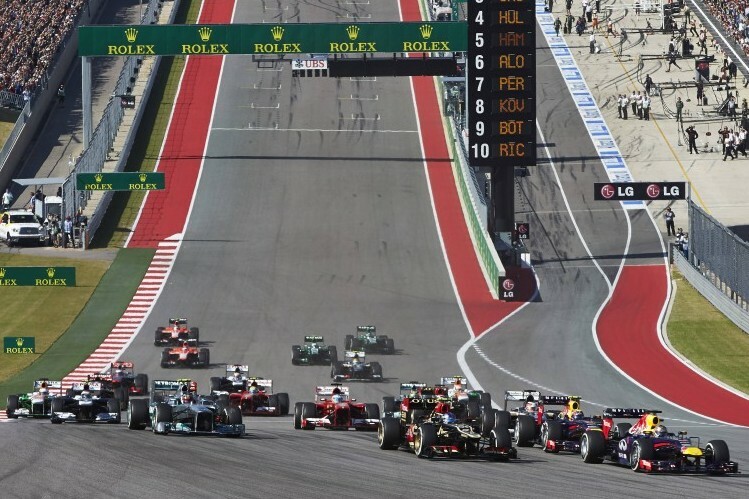 The 2019 United States of America Grand Prix will be held at the Circuit of the Americas or COTA for short. There’s a great range of options for COTA F1 with 7 general admission areas and a choice of 9 Grandstands with day 3-day weekend tickets available. There’s no need to select a particular general admission area when you purchase your ticket. Reviewers have recommended section at turn 19 which has views of turn 19, 20, 18 AND 1. Also recommended is turn 1 which has a view of the grid as well as turn 1. The circuit has a number of elevated grass banks so viewing is good. It’s possible to buy a ticket for the Bleachers Grandstand for £469 for a 3 day pass. Tickets purchased with Book F1 provide you with a reserved seat in the lower sections of Turn 4, 5, 9 or 11. The seats are allocated randomly by the circuit so it’s not possible to confirm which grandstand you will be seated in. It’s also not possible to buy a 3 day pass with Book F1. However, you can buy a 3 day pass with GooTickets and choose your preferred Grandstand. All premium stand tickets are sold on as a three day pass it’s not possible to buy a seat in a premium grandstand for race day only. There’s a choice of three grandstands in the premium section Turn 15, Turn 1 or the Main Grandstands which offers fantastic views of the start/finish line as well as the pits. Turn 1 stands are elevated giving you a great view of the circuit. It’s possible to see the start/finish line as well as the steep incline up to turn 1. Prices for Turn 1 Grandstand are from £402 per weekend ticket with GooTickets. Turn 15 stand has a great close up view of the F1 cars accelerating out of the corner. Prices are the same as Turn 1 and start at £402. Paddock Club is the most expensive at £4,006.00 (Friday-Sunday). The Paddock Club is the most luxurious and exclusive way to experience a race weekend, as close to the action as possible. Paddock Club packages include access to the best seats in the house, overlooking the pit lane, in a well appointed lounge, or in prime grandstand seats. Special experiences also offer a unique and unforgettable perspective on a race weekend, with pit lane walks, support race paddock entry, and optional driver appearances. An amazing chance to mix it with the cars and the stars, big name celebrities, engineers and the teams. Paddock Club members also benefit from outstanding gourmet service, starting with a full breakfast, followed by an open bar serving Champagne and delicious gourmet meals accompanied by fine wines. A Golden Card also includes a place in the Golden Card area complete with TV monitors, or at the Golden Card table in the Club Suite, the hospitality area designed for individuals and small groups, in a shared environment. Unrivaled views, unparalleled access, seamless service, the finest cuisine and unique opportunities to meet and greet, all provided with an extraordinary attention to detail. See the dedicated Paddock Club page in the Hospitality tab for more details. Post-Race Entertainment: On Saturday 21st October 2016 To be confirmed. COTA FanFest is also scheduled to return to downtown Austin this October, with a selection of free activities and live music performance taking place across some of Austin’s favourite bars and venues. More information on this will be provided closer to the event. Disabled Tickets: Please contact your ticket provider for information regarding Disabled Access. Child Tickets: No child tickets are available for this event. Children under 2 years can attend free if accompanied by an adult ticket holder. If your child requires their own seat then an adult ticket must be purchased. Disabled Tickets: Please contact your ticket provider for more information regarding disabled tickets.